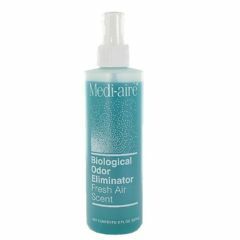 Eliminates unpleasant odors and rejuvenates the air with a long-lasting, fresh air scent from Medi-aire. A spray or two of Medi-aire’s concentrated formula terminates unpleasant odors present in hospitals, nursing homes, clinics and anywhere else that needs a quick touch up with a refreshing scent. Some air fresheners fool some of the noses some of the time, but most noses can tell the difference between disguising odors and eliminating them. That’s why Medi-aire, the air freshener that doesn’t just “freshen” or “perfume,” chemically combines with foul smelling odors to eliminate them. Mediaire rejuvenates the air. Even the worst biological odors associated with incontinence and ostomy appliances, dirty linen, bathrooms, and stale cigarette smoke disappear. Use it with a 91 year old incontinent person. Can't say enough about it. Doesn't just mask the smell, does away with it. CNA's would come and ask to borrow it. Ostomy air lifesavor. Breathable. Refreshing. Comfortable. Protective. Discreet. Great smell. On the go size. Home. Daily Use. Emergencies. I'm a lifetime (long Time) ostomy wearer and have tryed many different products, Med-aire deodorizer is the best @ killing the feces smell & gas smell. Because of the different breakdown of bowel the smell is stronger and Med-aire doesn't camouflage the smell it instantly kills the odor. No more embarrassing smell that lingers, instantly gone. Best product available!!!!!!!!!!!! by Barb the ostomy specialis from Oakdale, Mn. Product is used very sparingly (1or 2 squirts) in whatever room there has been a bowel movement: bathroom, at bedroom commode or wastebasket, etc. I like the baby-powder smell, which is not overpowering, and it doesn't seem to irritate the nose and lungs like some other products we have used. Reminiscent of hospital. Somewhat heavy odor. Very sweetish odor. It doesn't suit our personal preferences. I first encountered this product in the restroom at Johns Hopkins Hospital in Baltimore, Maryland. 1 spray COMPLETELY eliminates even the most offensive odors. I use it to freshen bathroom and trash can odors. This product does not just cover up odors - it completely eliminates them!! how long does it last in eliminating the odors after you spray it?